bowyer | "Name On The Trophy"
Over the years there have been many great players who’ve graced the Premier League, making it the most enjoyable entertaining and exciting domestic competition in the world. Players such as Cantona, Shearer, Henry, Ronaldo, Fabregas and Franny Jeffers have given even the non-football lovers a reason to tune in to Match of the Day on a Saturday night as they show us how the beautiful game can be truly just that. There have also been another set of players though, throughout the years, men who may have footballing ability but also have the knack of causing most of us to scream in anger whenever they touch the ball. I’m talking about the sort of players who if your daughter brought them home, you’d wish she was a lesbian. Players we love to hate. Now, not many of us actually know Premier League players on a personal level, but we can pretty much garner all we need to know about someone from their attitude on the pitch. Some players such as Paul Scholes for example, will never be truly hated, which is somewhat surprising considering he’s fouled every single Premier League player at least twice, because they just get on with the game in a quiet manner. However for every Paul Scholes, there’s a Robbie Savage, the sort of player that even some of his own fans struggle to find a fondness for. Here’s my own personal Premier League XI made up of players you’d rather glass, than have a pint with. Goalkeeper- Jens Lehman- Where do we start with Mr. Lehmann? Who can forget his chuckle-brothers esque shoving match with that other loveable chap Didier Drogba, or perhaps chasing a hapless linesman for 30 yards to berate him for a disputable decision. Lehmann also had a penchant for running out of his area often when not really required and for shoving, pushing, and generally antagonising anyone who came near him at a corner. 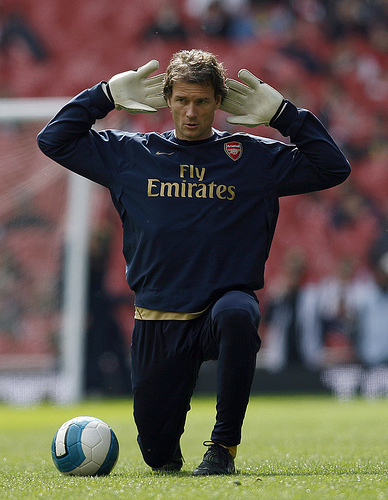 He left Arsenal in 2008 after 199 appearances , during which he picked up a Premier League and FA cup winner’s medal- and got himself sent of in the Champions League final. He was soon up to his old tricks in Germany, racing out of his area allowing Cologne’s Wilfried Sanou to fire into an empty net from 45 yards, he then got in trouble for attending Oktoberfest immediately after, despite being told not to. No doubt he found a few Colonge fans to buy him drinks. Left back – There was only ever going to be one wasn’t there, in fact its so obvious I’m not even going to put his name. The Chelsea left-back is actually one of the best in the world and has won every domestic honour there is several times, but he’s also one of the most hated men ever to put on a pair of football boots. When he’s not refusing to be booked by referees, he’s busy lamenting the fact that Thierry Henry got more chants than he did, or complaining that £3 million plus a year, is enough to make you crash your car- more than a few people were probably wishing it did. Right back- Gary Neville- I’m sorry but let’s be honest, while there are United fans that love Neville, they both live in Stretford apparently, for many, he’s become something of an embarassment. He may be one of the best right backs Old Trafford has ever seen, but more often than not his behaviour leaves a lot to be desired. Constantly saying anything to wind up the opposition, Neville is hated by anyone outside Old Trafford and even a few inside. As his appearances have become fewer his comments have increased, as have his actions. When he’s not giving players the bird, refusing to shake former collegues hands, or hiding behind Roy Keane in the tunnel, he’s making statements on anything from -deep breath now- Liverpool’s European exit, Carlos Tevez’s worth, Fabio Capello’s management ability, or how Premier League players are worth their wages. If Fred the Red ever retires, United have a ready made mascot. Centre back- William Gallas- Who can forget the sight of the happy-go-lucky Frenchman sitting in the St.Andrews centre circle sulking, as Birmingham’s James McFadden tucked away penalty. The fact that Gallas was captain only made it more ridiculous. He took a leaf out of the Roy Keane school of youngster morale boosting by claiming in an interview that Arsenal’s younger players needed to “show more courage” if they were to succeed, perhaps sulking in the centre circle is a good way for them to start. Gallas was subsequently dropped from the squad for the next match before being stripped of the captaincy. A must for every dressing room in need of a sense of camaraderie or wishing to give a good example to the younger players. Centre back- John Terry- Sorry Chelsea fans, well actually I’m not, but it’s yet another Chelsea defender who falls into the most hated category. His Guinness record breaking crying marathon following the Champion’s League final, apparently it lasted 34 days, still makes me wonder how anyone on earth could call him the ‘new Bobby Moore,’ I don’t recall England’s World Cup winning captain, sobbing his eyes out as he’s pictured with Pele in 1970. A player that often finds himself booed at away grounds- except at Old Trafford where, following Moscow, he always gets and ironic cheer. Left midfield- El Hadji Diouf- Although he can play in a number of positions for the purposes of this team he’s out on the left wing. What can you say about Diouf, honest, genuine, decent, clean, none of these words coud be used to describe a player who is almost as famous for spitting at people as he is for any footballing acheivements. Celtic fans, Arjan De Zeeuw and fans from Middlesboro have all been treated to a ‘gobby’ from the lovely lad from Senegal. 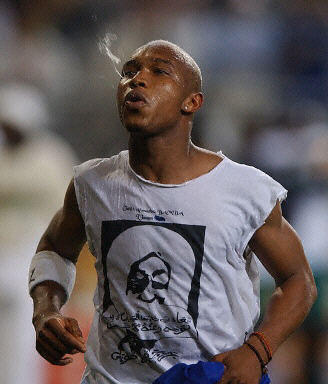 Diouf isn’t a one-trick pony however, no no, he’s got more to his game than just spittting. How about a bit of abuse to those horrible nasty ball-boys at Goodison Park, that’s what’s missing in the modern game. 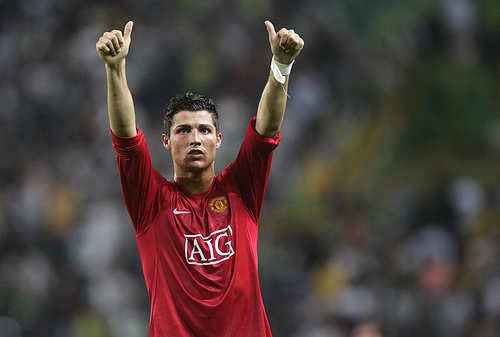 Right midfield- Cristiano Ronaldo- okay, I still love Ronnie, but as someone said to me when he was still at United: “He might be a tw*t, but he’s our tw*t.” I had to agree. 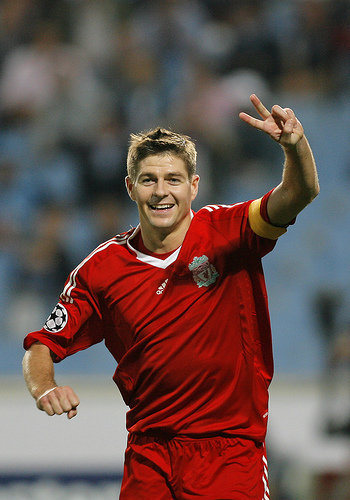 Centre midfield- Steven Gerrard- arguably the most difficult time I’ve ever had as a football fan was supporting England with Gerrard wearing the captain’s armband. His camera -kissing celebration at Old Trafford as Liverpool stormed to another trophyless season was bad enough but it was his ‘accidental’ assist to Drogba to gift Chelsea the title cemented my dislike of him. He should have been banned for a year, mind you making him England Captain was probably punishment enough. Leeds, West Ham and Newcastle man has found an army of haters wherever he’s gone. It’s not just the fact that he holds the record for the most bookings in Premier League history or that he’s even been sent off for fighting with his own team-mates, its also that, well he’s just got one of those faces, hasn’t he? Striker- Craig Bellamy- It takes a special player to get a list of enemies as long as Bellamy’s but the diminutive Welsh striker has managed to leave a trail of p*ssed off people behind him, wherever he’s gone. A career that took in Norwich, Coventry, Liverpool, Celtic, Newcastle and West Ham saw arguments with managers, and team-mates, ‘putt’ the striker on the most hated list of many. When Bellamy joined newly rich Manchester City life at Eastlands was fairly quiet for the little Welsh one, although he did find time to assault a United fan- who was being held by stewards- in the Manchester derby, United fans don’t hold grudges though, even giving Bellamy a bit of money on his next trip to Old Trafford. There was also his public support of John Terry which no doubt endeared him to Chelsea fans. He’s a player that can often be seen winding up the opposition and he usually succeeds in that endeavour. Bellamy’s loan move to Cardiff left Pentonville rather disheartened as they were looking for a new forward. 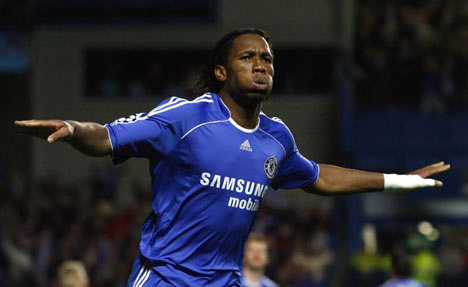 Striker- Didier Drogba- For me one of the funniest sights in recent Premier League history was Drogba having a ‘fit’ after being flying kicked by Jonny Evans, only to be booked by the referee. The Chelsea forward has become so known for falling over at the drop of a hat, that he’s even admitted it in interviews. Talking of interviews his post-match analysis following Chelsea’s Champion’s League exit to Barcelona was legendary. When he’s not diving, sulking and swearing he does score a lot of goals, but he’s done enough over the past few years to edge his way on to here. Subs bench– Mark Bosnich, Emmanuel Adebayor, Kevin Davies, Duncan Ferguson, Robbie Savage, Michael Brown, Stephen Hunt.